The NGD4800VQ is another gas dryer from Amana that is loaded with modern styling, a super capacity drum, and automatic features that make drying very convenient for you. You can choose from 9 wash cycles and 4 drying temperatures to program each wash according to the load. 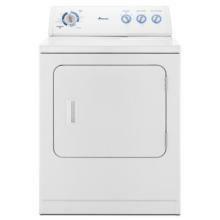 Clothes come out dry, wrinkle-free, and clean through the gas dryer features. Top features include automatic dryness control, which works by monitoring the drying temperatures and determining how long the cycles should last. There's a wrinkle prevention option that reduces wrinkles after the load is finished. Clothes tumble intermittently without heat to prevent wrinkles from forming. The super capacity drum comes with an interior drum light so you will be able to load and unload with ease, without leaving anything behind. Other basic options include dryness controls, with adjustable degree of dryness, from very dry to less dry, timed cycle, and the air fluff cycle for keeping thicker items like comforters as soft as the day you bought them. There are nine cycles and four temperature settings for better customization of the drying cycles. You also have the end-of-cycle signal, which informs you when the load is ready. The unit sports clean lines and a clean exterior. The accent colors give the unit a stylish and modern look that will definitely improve the face of your laundry room. The unit sports a reversible door swing, which is very handy if you need to put the unit in a small space. With the reversible door, opening and closing the door is not going to be a problem. The square door makes loading and unloading easier compared to rounded doors and provides for easier installation. This door, however, is solid plastic, unlike other models that sport transparent windows. The control panel is composed of three rotary dials with the main control dial set on the left corner of the panel. The optional laundry tower is a handy accessory composed of two oversized drawers with a pull out tray to keep laundry supplies in one place and ready for use. This dryer is very quiet due to the installed sound quiet package. The unit has a large capacity, but with its reversible swing door, it is very easy to install. The NGD4800VQ is stylish. The white exterior is clean, with its simple and elegant lines. The dryer is very easy to clean, and unloading is swift and easy. The unit is really cheap for its array of features. The automatic dryness feature means that you do not have to worry about overdrying. This works well with the wrinkle prevent option that puts a stop to wrinkles for times when you cannot get there in time as the end-of-cycle signal sounds off. The unit has an uneven, bottom which makes balancing it a little bit hard. The white exterior tends to yellow after a couple of years of use.